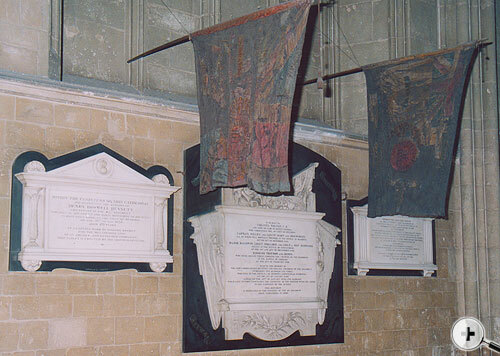 “On February 11th 1850 following the fourth anniversary of the Battle of Sobraon, the old Colours of the gallant 31st Regiment were by permission of the Dean and Chapter placed in the nave of Canterbury Cathedral, immediately above the marble testimonial executed by Mr Richardson, the sculptor, to those of the Regiment who fell on the Sutlej. These Colours were presented in 1827, at Meerut, in the East Indies by Lady Amherst, Lady of the Governor-General of India. The Colours were borne through the Affghanistan Campaign in 1842; and the Sutlej in 1845-46. In this last Campaign, twenty-six officers and upwards of 600 men were killed and wounded; and at Sobraon, both officers bearing these Colours – viz. Lieut. 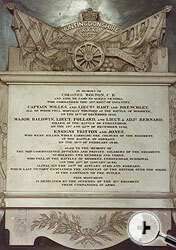 Tritton and Ensign Jones were mortally wounded. As recorded on silver plates inserted on the staves. The Colours are now (2008) in a very poor condition. However, the Memorial and Testimonial will remain long after the Colours have finally rotted away. 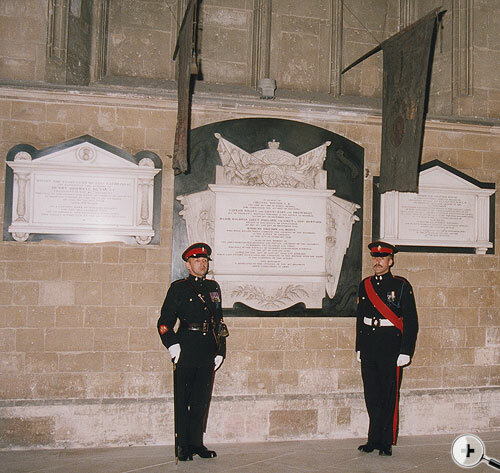 At the recent laying up of the 5th Bn The Queen’s Regiment Colours, in the Cathedral, the preacher drew attention to the Sobraon Colours, and the loyalty and selfless sacrifice of the Regiment and traditions carried forward through the years. The spelling of Affghanistan has not been changed from the original spelling. It is interesting to note, that the Battle Honour Affghanistan 1839 is on the six foot Regimental Colour of the Queen’s Royal Regiment at Clandon Park. The Queen's were also awarded the Battle Honour Affghanistan 1919 and both are borne on the Colour with different spelling. With acknowledgements to the London Illustrated News.